Creamy and yummy pasta soup. So delicious that it will have everyone asking for seconds. 1 Heat vegetable oil in a saucepan. 2 Add chopped garlic, onion and sauté until cooked. 3 Sprinkle the bouquet garni. Add celery, vegetables and sauté. 4 Mix in the Knorr Classic Thick Tomato Soup along with water. 5 Finally, add the pasta and continue to cook until tender. 6 Garnish with chopped parsley. 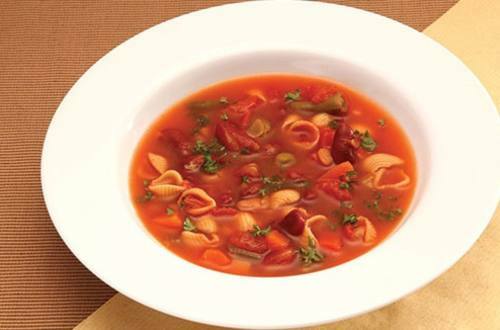 7 Packed with nutrient rich veggies, enjoy this lip smacking pasta soup!